Development studio Firemint has announced that they'll be the first ones to support fullscreen 1080p video-out in an upcoming major update of Real Racing 2 HD. The new version, still not available in the App Store, will allow iPad 2 users to connect their device to an HDTV and enjoy the game at 1080p without black borders, in all its fullscreen glory. This sounds like a major breakthrough on the iOS platform, and something we wish more developers will support in the future. Admittedly, being forced to play an iOS game on a television with black borders all around it is not a great experience. The new feature doesn't use scaling, it's full HD being mirrored to the TV. 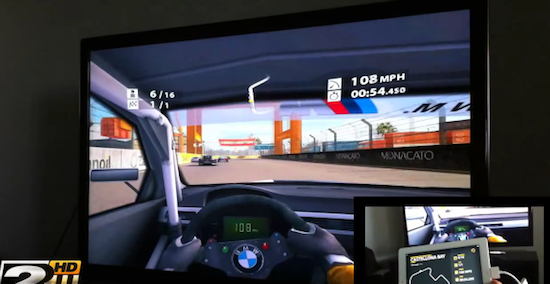 It runs at 30 frames per second and, while playing with the iPad connected via HDMI adaptor, the device's screen will display a map of the location in real-time.